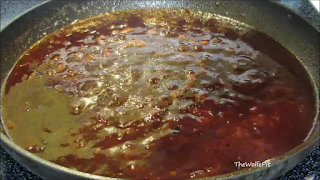 Fry bacon until crisp, remove from skillet and leave 2 TBS of grease in the skillet. Add onions and sauté for 5 minutes or until they begin to caramelize. Add garlic and continue sauteing for 2 minutes. Add all of the remaining ingredients including the fried bacon. Simmer uncovered for 8-10 minutes or until it's nice and thick.